And so it was that we returned to the van in Chatel, in need of a new adventure. As luck would have it, a new adventure presented itself to us, in the form of a message from my friend Kat. She texted me to say that she was currently on holiday with a company called Singletrack Safari and that holiday happened to be taking place in Chamonix. A quick phone call later and the Mr and I were booked in to join her for a couple of days guided riding in the beautiful area that surrounds Mont Blanc. We hurriedly packed up the van, chucked the bikes in and headed a couple of hours down the road to a wonderful campsite in Argentiere, a small town just outside Chamonix. The campsite was gorgeous; I’d definitely recommend it (especially as they have a BBQ night, where the food is, quite simply, stonking). That evening we headed up the hill in Argentiere to meet the people who were so kindly welcoming us onto their holiday. The group was made up of Kat and three jolly nice chaps from Birmingham. We also met the guides, Martin and George, who assured us that we weren’t imposing ourselves at all. It was a good start, and I felt much happier about the outlook for the rest of our holiday than I had just a few hours earlier, when I was feeling blue in Chatel. After a cosy night in the van, we awoke to blue skies and a feeling of optimism. We fueled up on porridge and tea (always tea! ), made our packed lunches and headed up to meet the group, who were staying in a lovely chalet just up the hill. And that’s where the fun really began. 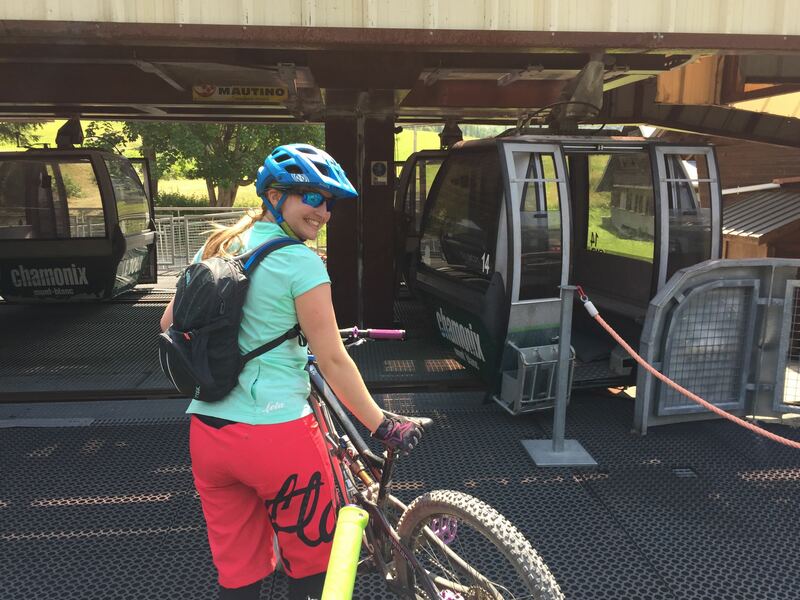 The day started with a sweaty uphill section to the foot of a chairlift. I have to admit, I did struggle to keep up with the others on the uphill and my confidence began to wane. But we were with a very encouraging bunch of people and they geed me along quite merrily. The chair lift presented the next challenge. This time, it was a little box that I had to get in with my bike, sort of propping it up diagonally and hoping that the doors would close. They did and I started my journey up the mountain. At the top we found a small bike park, which we rode to take us back down the mountain again. 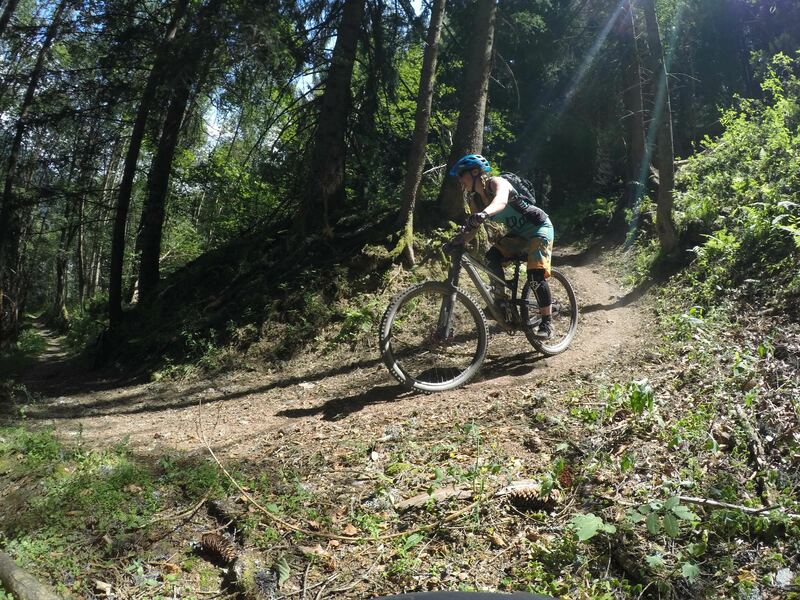 It was far more enjoyable than in Chatel, as we were pretty much the only people riding there and I started to feel a little happier on my bike again. Bike parks will never be my favourite kind of riding though, so I was relived to hear the guys in the group saying the same thing. The guides listened and so off we headed back up the chairlift to ride some of the most beautiful singletrack I have ever seen. 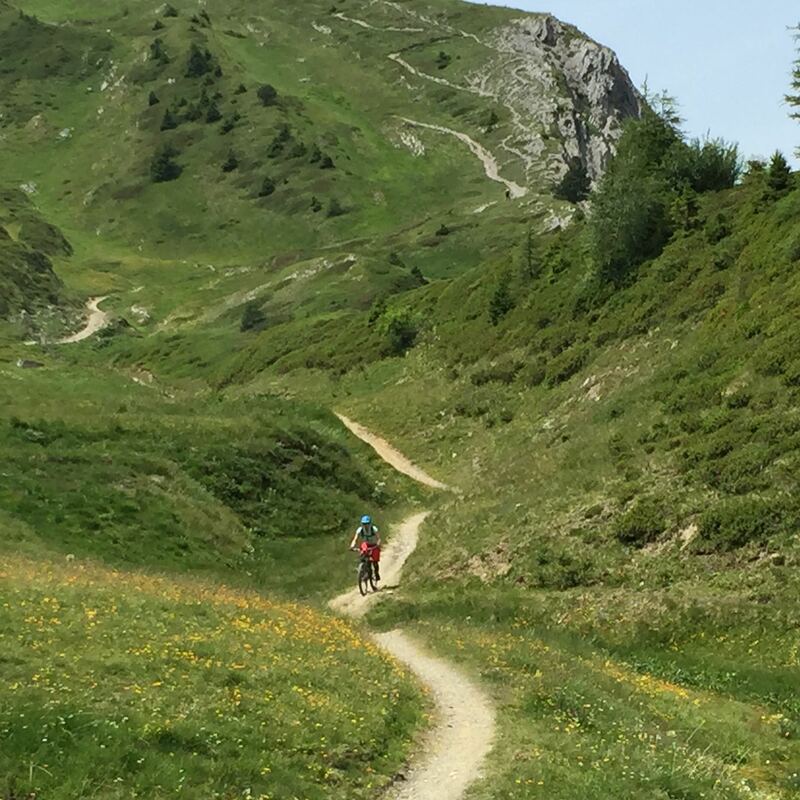 We were riding singletrack that wended it’s way in and out of France and Switzerland, over the most luscious green mountains, with what were, quite simply, astounding views. There were switchbacks galore, with loose dusty terrain, and not a pyjama warrior in sight. I LOVED it. What’s not to love about that trail?! We ate our packed lunches, admiring the views, and were overtaken by a group of American hikers, who were intrigued by what we were up to. After lunch we made our way down some rocky, exposed singletrack that went on and on, weaving our way in and out of that group of hikers, who gasped in aww at the fact we were riding down here. I have to admit, I got pretty nervous on some of this stuff. I was a long way behind the guys riding in front, but a long way in front of those behind, and I felt pretty alone on the exposed, rocky switchbacks that just kept coming. They got in my head a bit, so I pushed a few and then beat myself up for doing so. This was a big ride, not for the faint-hearted…the singletrack went on forever and it was awesome. Like, really. And the next day? Even more awesome! The guides split the group, so just Kat, the Mr and I went with George, whilst the Brummies headed off with Martin for a different ride. Our ride took us to yet more gorgeous singletrack, through woods, down steep, loose tracks and up sweaty climbs, as well as a few more chairlifts just for good measure. We paused in the woods to practice my switchbacks, which, by the way, I nailed (after some super coaching from George). My favourite section was named ‘Norwegian Wood’ and consisted of the most beautiful flowy singletrack through the trees. The trail just went on and on and spat us out in a clearing with a wonderful view of Mont Blanc. Never have I used the word awesome so fittingly. We finished the ride off with a whizz down the bike park trails at Les Houches. These were a different kind of bike park trails. These ones were home to lots of tricksy roots, with multiple lines through the woods. It was magic! There was a long section of board walk (eek!) which I was happy to ride without drama. It was a great end to a great day. Chamonix was the perfect antidote to Chatel and a fitting end to the riding part of our holiday (we spent the next three days exploring Paris). I have to say a big thank you to Singletrack Safari for sending us away on a high. 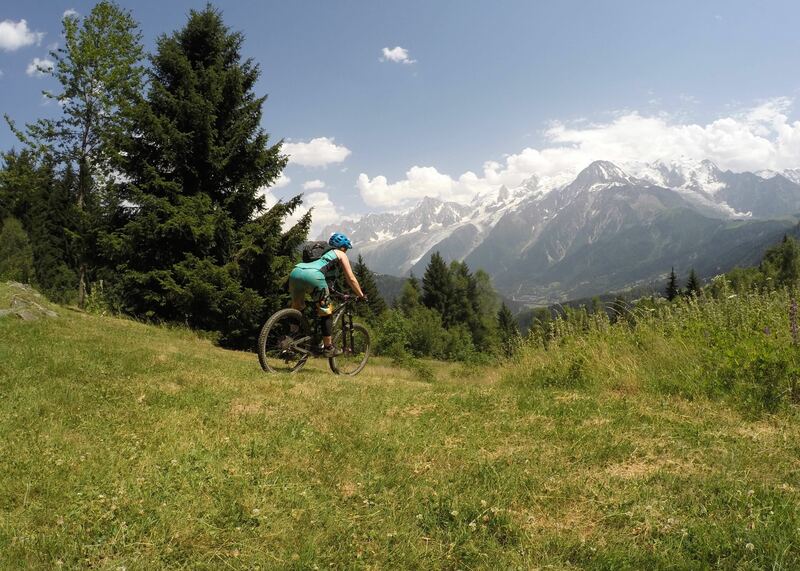 If you’re planning on taking a trip to Chamonix, I couldn’t recommend them enough – knowledgable guides who are patient and happy to coach, riding some of the most amazing trails you could ever hope to come across. 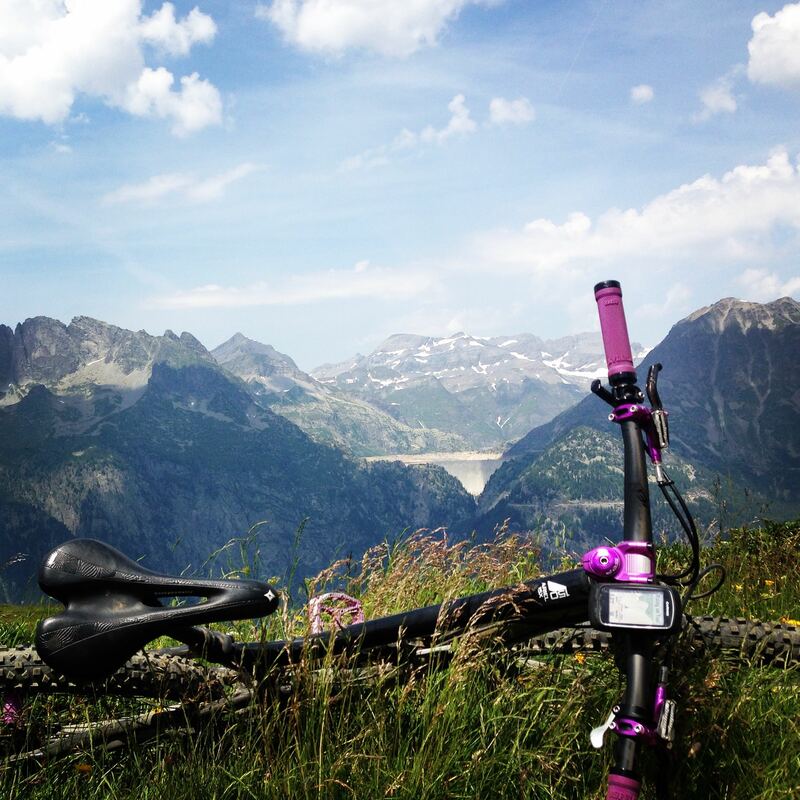 I left Chamonix a happy person and a better rider. So, that’s it. J’adore VTT. I’ll be back for more.